Liquid, slightly viscous, powerful acidic special cleaner without harmful sulfuric acid. Removes stubborn dirt such as limestone, urine, boilers, rust, cement and concrete crusts. Cleans all acid-resistant materials such as tiles, tiles, porcelain, stoneware, sinks, WC basins. Dissolves strong cement layers, glassy surfaces and concrete crusts, depending on the concentration and the reaction time. Not suitable for cleaning aluminum, lacquer surfaces and stainless steel parts. nextzett KBR is a liquid, slightly viscous, powerful acidic special cleaner based on special surfactant combinations, fillers and active acids. 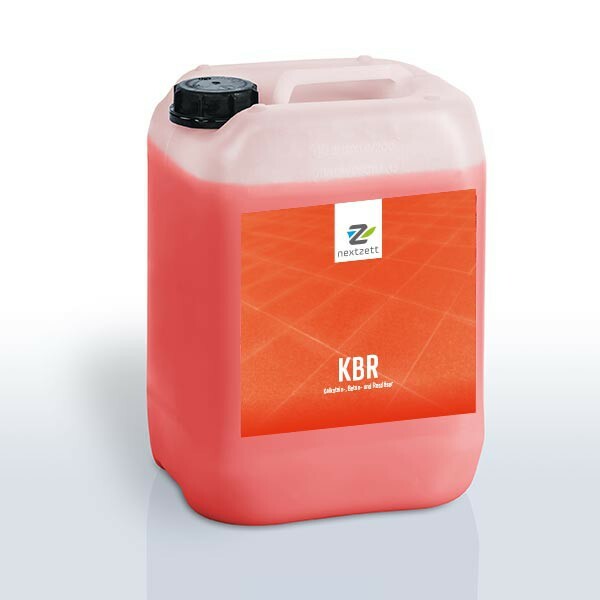 nextzett KBR is due to its composition excellent as remover for limescale, urine and boiler scale, rust, cement and concrete crusts. It cleans all acid-resistant materials such as tiles, tiles, porcelain, stoneware, sinks and WC basins. nextzett KBR is not suitable for cleaning aluminum and Stainless Steel-parts! Depending on the concentration and exposure time, it also dissolves strong cement layers and concrete crusts. nextzett KBR is suitable for use in cement plants and the processing industry, in the iron industry, petrol stations and garages and washing halls, public toilets and bathrooms. nextzett KBR can in spray, brush, or dip methods are applied. Concentration and exposure time depend on the degree of pollution. For normal soiling, concentrations between 2-10% and exposure times are up to 5 minutes. Absorbent surfaces (joints) should be wetted before cleaning with water. Nextzett KBR is diluted with cold tap water. After cleaning, rinse thoroughly with plenty of water. Drying is to be avoided. Do not apply on painted metal surfaces (eg aluminum rims, high-gloss metallic paints).